Some books have the ability to transport you right back to where you were when you first read them. Young'un is one of those books for me. From the time I was 5 until I was 13 we lived in a house that was a couple of hundred years old. It had formerly been housing for the mill workers from the silk mills that used to operate in town. I loved that house. It was full of nooks and crannies and creaky floors and a strange hodgepodge of rooms. There was an enclosed front porch that had been added on at some point. We kept all our bikes on it in a tangle of wheels and handlebars and we kept our books there on a long concrete ledge that went all around the porch. It was hot in the summer and cold in the winter and you had to clamber over and around bikes in order to look at the books but on any given day that is where you could find me. The books were as much of a hodgepodge as the house. Children's books were next to Shakespeare which was next to Jane Austen. I was free to read whatever I wanted and I spent a lot of time dipping in and out of the books out there. 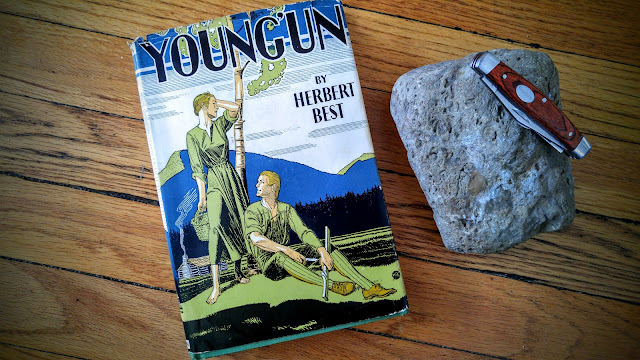 Young'un was one of the books that lived out on that porch and when I picked it up to reread it the other day I was immediately back in my childhood. I don't think Young'un is meant to be a children's book even though the main character is young at the start of the book. It is more a picture of a time period, a way of life, and a people that are all long gone. Old Man Post returns to his farm to find his house burnt down and his wife dead. He is a trapper and has never been comfortable settled on a farm but has lived that life for his wife and children. When his wife dies he turns and walks into the woods leaving the children to fend for themselves. Somehow they manage, though frequently only by the skin of their teeth. The oldest daughter is not a huge part of the book, especially because part way through she leaves to marry the preacher. Dan'l runs the farm, determined to manage as Pa would have done. His image of Pa bears little resemblance to the actual man but the myth he builds up carries him through until he can stand on his own two feet. The book is told through the eyes of Young'un. Young'un sees how warped Dan'l's view of their father is but works beside him to save the farm. In the process, she grows from a young girl who can almost best Preacher in a spitting contest to a young woman who has the wisdom to deal lovingly with her father when he does return. The book is written in the vernacular of the day but surprisingly it is not as irritating as you might expect. It is full of moments of humor that I really enjoyed. For example, this description of a woman is fantastic. Can't you just picture her? "Even when, like now, she wasn't wearing her silk, her clothes sot so close they looked to be her own pelt, and set you to wondering where you'd start to skin her." I think this is probably set in the late 1700s in a small settlement in New York. The picture of life it gives from back then is interesting. Reading it, I could smell the acorn cakes baking in the fire, hear the ring of the blacksmith's hammer, and feel the cool water as Young'un dove into her swimming hole. Some of the descriptions were beautiful. "For it was a day when sorrow and laughter started off in opposite directions, only to meet, unexpected, like squirrels chasing each other around a tree bole. And there was a sort of happiness lurking in the sorrow and when you laughed there was a kind of choke deep inside you." It can be hard to judge a book that has been loved for many years. Your emotions and memories are too bound up to give a clear judgement. What I do know is that once again the story pulled me in, once again I was walking down the forest trail with Young'un, once again I felt a part of a little settlement in New York, and once again I was sorry when it ended. It sounds lovely! I have books like that too, that I can't objectively tell if they're any good or not because I've just loved them so long. Yes, they become bound up in your history and even your identity in some way. Precisely! A great deal of my identity is bound up in the books I've read most often.